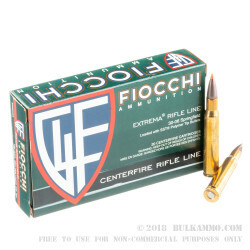 The .30-06, Fiocchi Extrema rifle hunting round delivers excellent performance and accuracy against deer, boar, elk or other similarly sized game and is an ideal rounds for your next hunt. These rounds feature Hornady’s SST or Super Shock Ttipped projectile, designed to deliver incredible amount and energy on impact. These rounds feature a polymer tip which initiates immediate and controlled expansion, while the Secant Oglive boat tail design and Interlock ring make for an incredibly flat shooting round that maintains its weight before impact. 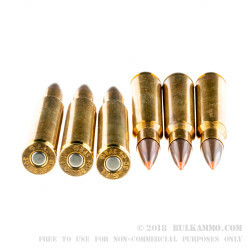 The rounds in this bulk package of 200 .30-06’s contain a 150-grain Super Shock Tip projectile, loaded into boxer-primed, noncorrosive, reloadable brass cases and comes with ten, 20 round boxes. Since 1876, Fiocchi Munizioni has been one of the most popular brands in the world for ammunition manufacturing. 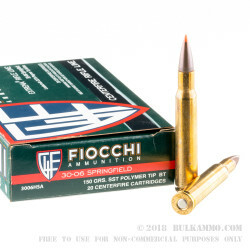 A popular choice among professionals and casual shooters, Fiocchi uses only the highest quality components to create high-performance ammunition across a wide variety of applications. Q: Is this ammo non-magnetic? 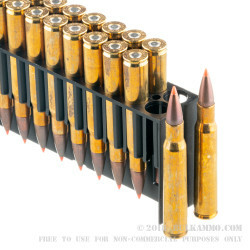 A: Hello Chuck, This ammunition features a copper jacket and lead core. There is no steel content in this projectile and as a result, will have no issues passing a magnet test.